One of the best ways to support the CRC’s mission is to donate your time and talent to one of the 8 priority areas. Below are a few upcoming volunteer opportunities in each of the priority areas, but this is only a small sampling of the many opportunities that are out there. Our partner, Hands On Greater Richmond is an excellent resource to help you find a volunteer opportunity that lets you use your passions to improve the quality of life in the Richmond Region! 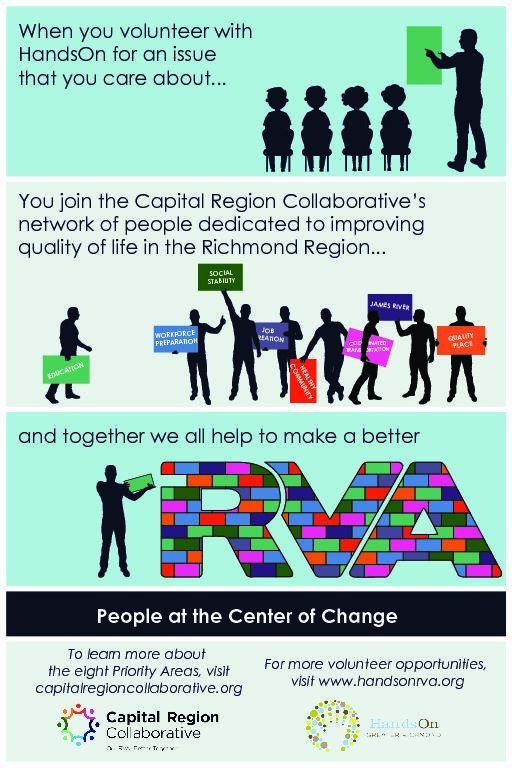 You can also check out ConnectVA for more ways to engage with and support the Richmond Region’s non-profit community. Commit to spending two hours a week mentoring a small group of 5th-8th graders with Higher Achievement. Higher Achievement hosts afterschool and summer academic programs that gives youth from at-risk communities their best opportunity to succeed in middle school – and in life. Offer your business expertise to RVA Works by speaking on a business topic to members of the Richmond Community. RVA works is a public-private partnership that aims to increase economic growth and create jobs in the Richmond region. Help the Virginia Science Museum educate Richmond’s youth on science topics that relate to careers in STEM fields. Lean more about this opportunity here. Help support FeedMore by becoming a regular volunteer at the food bank. It takes 250 volunteers every day to keep FeedMore’s programs up and running! Lean more about how you can become a FeedMore volunteer here. Help the Help Brigade provide free medical services to those in need in Richmond. The Health Brigade has volunteer opportunities for both licensed medical professionals and unlicensed volunteers. Help the Virginia Department of Transportation keep the Richmond region’s highways clean and unobstructed. Help keep the James River Park System beautiful by volunteering to clean the trails. Learn more about on-going opportunities here. Maymont depends on volunteers to keep this historic landmark estate in Richmond an asset for the community. Learn more about Maymont’s many volunteer opportunities here.